It isn't the holiday season unless you play some board games with family and friends. We have rounded up a collection of games to either put under the tree or cram into a stocking. The list includes a great gateway title, a light family title, and some intense selections. Something for any gamer that may appear on your list. If you are looking for a great stocking stuffer than look no further than The Game. The Game is a quick cooperative game, in which the goal is to collectively play every card in the game. Each turn is simple. You play two cards in either a descending or ascending pile. The goal is to play all of the cards in the deck, numbered 2-98. While it sounds simple, limited communication, and the frustration of watching someone skip your number make this game extremely tense. This is my new go-to gateway game and everyone I have played it with had an absolute blast. So you’ve all played Pandemic, right? You’re an expert at saving the world from various plagues and terrible diseases? Do you want to take your Pandemic to the next level? Pandemic Legacy is your opportunity for a fairly unique gaming experience. Pandemic and Pandemic Legacy are cooperative games where you, along with your fellow game players, work together to prevent the world from being overrun with diseases. Where Pandemic differs from Legacy is that when the original Pandemic is over, you just reset your board, reshuffle, and play again. Pandemic Legacy instead offers you you something different. The game takes place over 12 in-game “months” that can be played up to 2 times each if you fail to win the month. As you play the game, you physically alter the board and physically destroy cards when instructed to by the game. When you finish January, you don’t reset the board. The board (and thus world) conditions continue on to the next time - so it is highly recommended that you play with the same group to get the best overall experience. With 12 to 24 total plays, each game will will be unique to your experience. Interested yet? 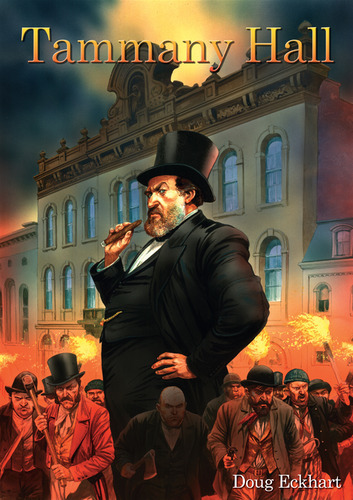 I can’t say I played many games but the one that stands out the most to me is Tammany Hall. It’s a political game of backstabbing and deception in which you try to rule New York through your control of immigrant populations. Every four turns, you will elect a mayor. The mayor gets to choose their own fate by assigning positions to the other players, such as chief of police or council president. If you’re playing the game right, you will exploit your position, lie to your friends, and climb over the backs of your constituents to gain more power, just like in real life! I am unapologetic in my love for Monopoly, even though I know this is an unpopular position among people who are “serious” gamers. 99% Invisible just did a great episode about it (http://99percentinvisible.org/episode/the-landlords-game/), in fact. I certainly admit that it's not the easiest game to play, though. I've got a bunch of kids running around, and the idea of leaving out a board game for 3-4 days for the tiniest among them to utterly destroy makes me rue the idea of actually playing Monopoly right now. Enter the wonderful stocking-stuffer that is Monopoly Deal. My first thought was that a Monopoly card game was a patent absurdity, but once I started playing, I was really impressed by how they were able to translate the traditional board game into a new, and much speedier, format. It's been a lot of fun to play, you can complete a game in 15-20 minutes, and the set we got game with a tiny robot Monopoly piece. What's not to love? I know, another London cliche from me; apologies. But this game truly saved many a family xmas, growing up. It’s simple, relatively quick (Monopoly and Risk always led to desertion by half the family before I’d even got to Kamchatka, or nabbed Mayfair/ Nob Hill etc) and is the sort of game anyone can win, so you never get the frustration of more skill or knowledge intensive playing experiences. Roll the dice, move your Sherlock piece around the London streets, collect clues, solve crime! Easy to play with a glass in your other hand whilst drunkenly humming carols, and also a great tribute to Doyle’s world.